2019 Ford Edge ST First Drive Review: A Killer With A Conscience? Admit it, you knew this was always going to be how this whole crossover binge played out. 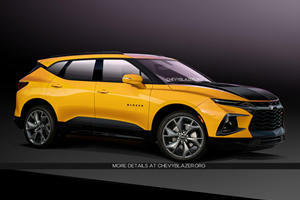 We’re no longer witness to a passing fad, this is a full-blown revolution that started with body-on-frame SUVs and cheap gas prices and has mutated into an evolutionary branch of its own on the automobile’s phylogenetic tree. By now we can assume it will only end when crossovers turn sedans into the exotic choice to opt for at the dealership. For most customers, it’s the combination of utility and driving dynamics sophisticated enough to match a sedan’s that pulls them into the world of crossovers. Others are lulled in by the feeling of safety they get from having other vehicles on the road actually respect them. But for the performance lovers out there, the sports SUV—and believe us, that feels weird to type—has remained elusive for anyone not looking to spend Porsche Macan or Mercedes-AMG GLE 43 money. Until now that is. 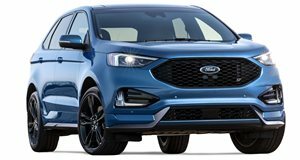 Just as we thought this mad dash to churn out crossovers at an alarming rate was turning into a bubble, Ford seems to have found another niche to focus on: the budget performance crossover. Enter the Edge ST, Ford’s latest addition to the ST family and the newest way to have a midlife crisis without compromising one’s ability to be a responsible adult during the crisis’ rebound. As a vehicular oddity, the Edge ST is a car that has to be experienced on open roads with the throttle pinned to be properly digested. We were fortunate enough to be invited to Park City, Utah, where Ford handed us the keys to a White Platinum Edge ST and set us loose on winding roads that traverse aspen-covered mountains. The only way to find our way back to the hotel was to snake our way down those roads at high rates of speed, blowing the brittle yellow leaves off trees that were going into hibernation as fall weather took over. If the scenery isn’t enough to make you jealous, then maybe listing the performance metrics propelling that party will do the trick. Open the hood of the Edge ST and you find that the standard 2.0-liter inline-four EcoBoost has been replaced by a transversally mounted 2.7-liter EcoBoost V6. All-wheel drive comes standard on the ST, ensuring that this mighty engine pumps 335 horsepower and 380 lb-ft of torque to all four wheels (or two if the computers sense power at the rear isn’t necessary) through an eight-speed automatic transmission. Powered by the same engine we’ve come to expect linear, lag-free power delivery from in the F-150, the Edge ST lives up to its name when a lead foot hammers down. Put the Edge in Sport mode and the optional B & O speakers take on the additional role of augmenting the dual exhaust to liven up a sprint to 60 mph from standstill. With the “S” button at the center of the shift knob pressed, that sprint can take place in under six seconds thanks to sharpened throttle responses and gears that hold on just a little longer to ensure all the torque is wrung out of the rev range. It’s best to leave the Edge ST in automatic mode when attempting a full throttle acceleration run, but using the wheel-mounted paddle shifters does help liven up the experience in the corners. If there’s one thing to take home from Ford’s ST lineup, it’s that the engineers don’t just grace the car with a more powerful engine and extra badging. There’s more to it than that, and you can tell by the blacked-out mesh grille. Engineers claim it increases airflow to the high-output engine by 40% over the standard Edge’s Gillette razor-styled grille. And then there are the lowered side skirts that reduce drag to complement the blacked-out aesthetic of the rims and exterior trim. Pushing the Edge ST around corners reveals changes to the suspension as well. Without a set of fancy adjustable dampers to change the ride stiffness according to the drive mode, Edge ST engineers had to work proper handling dynamics into a vehicle that can endure daily commutes, trips to Costco, and the occasional light off-roading required for a weekend adventure out of town. The system operates comfortably on a variety of road surfaces despite being stiffened by 15% up front and 20% at the rear over the regular Edge. This ensures minimal amounts of body roll and relatively high stability at speed without allowing for an insufferable daily driving experience. The resistance felt through the steering rack follows that same logic—heavier than usual but nothing that will replace bicep curls at the gym—and the Edge ST could almost be mistaken for a comfort-oriented vehicle on more forgiving roads if it weren’t for the interior. In all honesty, it’s far from luxurious, the sacrifice buyers make for not buying a sporting crossover from a Jaguar or Audi, but it does have a few frills to advertise to occupants that they aren’t in an ordinary Edge. Bolstered seats emblazoned with “ST” logos are the first hints of that from inside, and more observant riders will notice the “Ford Performance” lettering on the doorsills, floor mats, and on the steering wheel. White stitching adds contrast to the standard black interior, the gauge cluster—remaining slightly dated in looks but not in technological ability—reserves ST exclusive display modes that are useful for anyone trying to take the Edge ST to the race track. It’s best to ignore the gauges altogether when descending Utah’s steep mountain roads in a huff unless the $2,695 ST Performance Brake package has been selected. Given the heavier engine, a higher number of standard features, and zero weight-savings strategies to reduce mass, the Edge ST weighs more than the base model. Needless to say, having pads that bite hard helps ease anxiety, especially when towing anything that approaches the ST’s 3,500-pound towing limit. In addition to the brakes, worrywarts may enjoy the fact that the Edge ST’s all-wheel-drive system features multiple modes that tailor power delivery to varying road conditions or amounts of driver skill. Normal mode is, well, fairly normal. But with clouds hovering over Park City’s skies and sending the remnants of Hurricane Florence down onto the auto cross track that Ford had set up for us to lap, we toggled the stability control selector past Traction Control Off and into Advance Trac Sport/Track mode. Another tap turns the Advance Trac system off completely, but with a slick track and a ten-second penalty going to drivers who give one of the cones encircling the track a love tap, we kept it on and tried to beat the lap times set by other journalists and Ford’s experienced engineers. Part of the competition entailed stopping after lap one, opening the motorized tailgate, piling boxes into the rear of the Edge, and getting back in for lap two. Along with showing us we could use more practice at the track, the stunt was intended to prove that the Edge ST has the cargo space to best the competition. But Is It A Bargain? With more space for groceries or outdoor gear than the Audi SQ5, Porsche Macan S, Jaguar F-Pace S, Maserati Levante, and the Mercedes-AMG GLC 43, the Edge ST remains the more practical choice for regular people who have monthly budgets to fit their car payment into. The only thing holding it back from being the true car of the people? Ironically, the price. While it doesn’t command Maserati levels of sticker shock, it does have a starting price of $43,350 including destination. 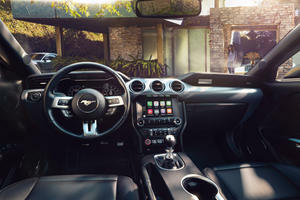 Go heavy on the options by adding comforts such as the $5,585 401A equipment package, which adds voice activation navigation, the always pleasant to use SYNC 3 infotainment, automatic parallel parking via Active Park Assist, Ford's Co-Pilot 360 Assist that comes with automatic cruise control, stop/go functionality, Evasive Steering, and Lane Centering, and the price tag approaches $50k. Going a step further means adding extras like the aforementioned ST braking package, which includes a set of 21-inch wheels that cost $995 without the fancy brakes, and a $1,595 panoramic roof. Fully bloated, the Edge ST can leave a dealership at $55,005 including destination. Given that most base models of the Ford’s upmarket competitors can be snagged in this range, a price tag like this puts the Edge ST out of reach for budget performance SUV hopefuls. Then again, Ford could rebut and say it’s extending the reach of the performance SUV lower and potentially forcing the rest of the market to consider an answer to the Edge ST. Whether a future where the horsepower wars make it to the everyday crossover happens or not, there’s no arguing that Ford has gone ahead and done what niche-filling addicts Mercedes, BMW, and Audi haven’t: find another untapped corner of the market and put its best foot forth. It resembles the Camaro, so how about a V8? But don't we all like that new car scent? The Chinese don't. 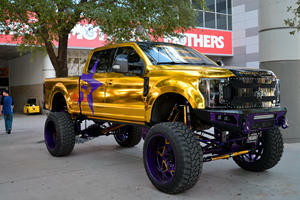 The best aftermarket tuning show had some awesome reveals.